If you want a watch that looks more like a diamond bracelet than something used to tell the time, then the Cartier Delices HPI00459 women’s watch is exactly the timepiece you’ve been searching for. This watch is positively dripping in diamonds. The band, dial and bezel are all 18K white gold covered with round-cut, shining, sparkling diamonds. This timepiece also has an interesting, unconventional shape. 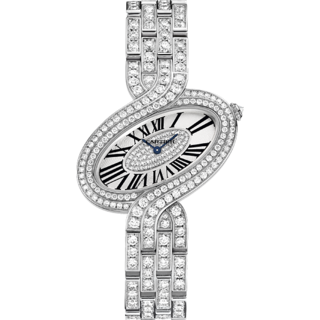 The dial is a slanted oval shape, with the Roman numerals placed at an angle around the diamond encrusted dial. The hands are the classic Cartier blue, and the dial covering is made from the ultra scratch resistant sapphire crystal. The crystal used in this watch is the most expensive and durable watch covering available, a sure sign of this watches value and dependability. While I wouldn’t recommend wearing this watch anywhere near the water, you certainly could if you wanted to. It is water resistant up to 30 meters, which makes it suitable for wear during the rain, washing your car or even light, recreational swimming. The band has a hidden clasp so the look of a straight through diamond bracelet isn’t interrupted by an out of place clasp. This watch is made from the highest quality materials available. The 18K white gold combines with the diamonds to create and effortlessly elegant, refined watch that is sure to make any bling-lover pleased. 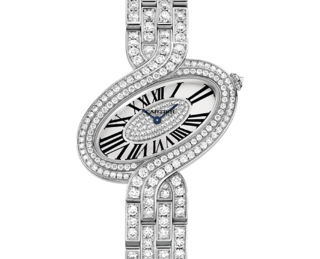 If you’re looking for a show stopper, the Cartier Delices HPI00459 Women’s Watch is absolutely the timepiece you should have. This is not an inexpensive watch. I can’t imagine that anyone looking into purchasing this timepiece would be deterred by the price, it’s obvious that a Cartier watch that is covered in diamonds is going to be expensive. That aside, my other concern is the readability of this watch. While the diamonds are absolutely stunning, they, combined with the odd shape of the timepiece, make it difficult to read, though not impossible. The last thing about this specific watch is that because of the amount of diamonds that are on it, it may be too glitzy and showy for some. 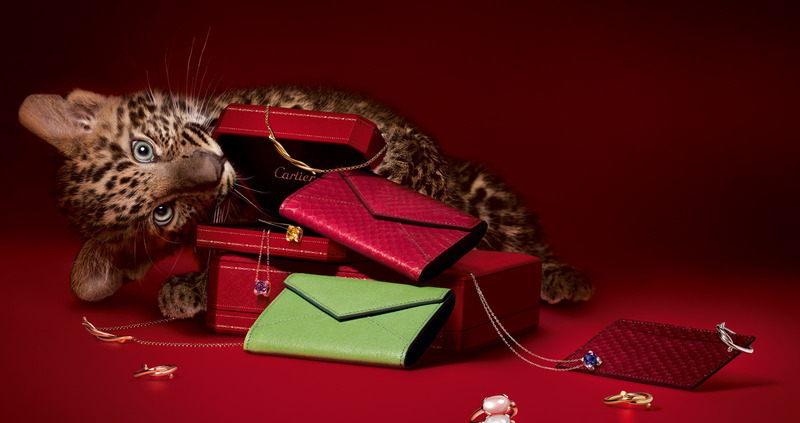 If that is the case, Cartier makes many other watches that have varying degrees of diamond shine that would suit any desired preference. This watch is perfect for a woman that wants a stunning, eye-catching timepiece to wear on special occasions.